The Dominant represented the initial attempt by Dennis to offer an underfloor engined single deck chassis. Like the contemporary Regal IV, Royal Tiger, Freeline and Arab UF models, the Dominant was a heavy beast, but, unlike those competitors, it never achieved quantity production. The engine was a horizontal version of the advanced 24 valve wet liner O6 diesel of 7.58 litres coupled to the Hobbs semi automatic gearbox, which used disc clutches instead of annular brake bands to engage the gears. A two speed axle was also specified. The middle section of the chassis was ‘humped’ slightly to clear the engine and gearbox, which made the design rather more difficult to body than its competitors. Only three Dominants were made, and all were shown at the 1950 Commercial Motor Show. One was displayed in left hand drive chassis form, but it is believed never to have run under its own power. The other two received Strachans bus bodies of very different character. The bus in the demonstration park had a supercharged (not turbocharged) engine, raising power from 100bhp to 130 bhp, and full air braking, and had a front entrance bus body, probably with 41 seats, of conventional appearance. The other, vacuum braked Dominant became very well known as Aldershot & District No.174, HOU 900, and its B41C body was an example of the uncertain approach to styling adopted by a number of coach builders in the early years of the underfloor engined chassis. The initial strange wing pattern was subsequently simplified to a more usual style by A&D as seen in the picture above. The Hobbs transmission revealed early weaknesses, and it was replaced in both running Dominants by standard Dennis two plate clutches and five speed gearboxes. The demonstrator was sold to Trimdon Motor Services who registered it MUP 297 and ran it, now without the supercharger, for seven years, before selling it on to become a mobile shop. The other Dominant remained in the Aldershot & District fleet from 1951 for fourteen years, spending much of that time ploughing its way on the Aldershot – Cove group of services. 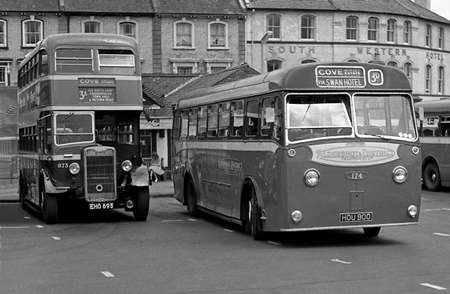 It is seen here in 1961 leaving Aldershot Bus Station with Weymann L25/26R rebodied Guy Arab I of 1943 No.873, EHO 695 alongside. This Arab was one of a number of such chassis originally destined for, but ultimately not wanted by London Transport. It was initially fitted for A&D service with a Strachans L22/26R body, rebodied in 1950, and finally withdrawn in 1962. Thank you for posting this view. It has settled a problem I’ve had for some years, in respect of my "bought" slides. Not all photographs come with an indication of where (and/or when) they were taken. I have several where this building features in the background. Clearly, it was in A&D or AV territory, but the precise location was a mystery until now! Thanks for the links Roger. The original wing embellishments were rather odd – those sort of things did not really belong on coaches of the new underfloor-engined era, but the front one being the ‘wrong way round’ was plain silly. Many coachbuilders and operators of the time must have been really confused as to what to do with this new layout of vehicle. However once A&D had modified it in the fashion depicted on this photo I think it looked rather nice, with its gently curved lower windscreen line just taking the edge of any tendency to boxiness. The A&D livery of the period was just superb and enhanced any vehicle. The Arab looks really fine too. Weymann bodies looked great on any type of chassis. Many operators who rebodied their utilities after the war also converted them to the low-bonnetted Arab III layout, but I always felt – purely from an enthusiast/aesthetic perspective – that the Arab II’s original tall bonnet looked far more balanced, and in keeping with its rugged, no-nonsense nature. The bus station at Aldershot was opened in August 1933, and I believe that it was the only company owned bus station within the BET group. Sadly, it has now gone. The site is now occupied by residential development, and the replacement bus station is an austere affair near the railway station entrance. Omnibus Stations Ltd, a company jointly owned by North Western and Ribble owned Lower Mosley St Bus Station Manchester, also long gone. The Wilts and Dorset bus station in Endless Street, Salisbury is up for sale. When it is gone all the services using it will be decanted onto the surrounding streets to join the local services in an already congested City centre. Is this progress? No,it’s called asset stripping. Sorry to go off topic. I’m a great Dennis fan and on a sunny summer afternoon I sometimes cut my grass with my 1960’s Dennis lawnmower. I know it’s off topic, unless the lawnmowers were scale model prototypes for buses, dustcarts or fire appliances, but I’d no idea they were still being made as recently as the 60’s. I saw one at Amberley on one occasion, several years ago. To be fair, Paragon, I visit Salisbury every couple of months or so, to exercise my "dodders’ pass". Salisbury Bus Station is in dire need of fairly extensive refurbishment, at least. Is it purely asset stripping, or is it another of those odd instances where the site is sold and then leased back? Is the aim to clog Blue Boar Row, Endless Street and New Canal even more than they are already as a permanent feature, so even more shoppers will be discouraged from visiting, and go out of town or use mail order/internet shopping instead? You’re right. It is NOT progress! ………with supercharger, no doubt, Paragon! Paragon, Is it a petrol mower? With reference to Roger’s comment (20/01) about BET-owned bus stations . . . how about: Cleckheaton, Dewsbury, Batley – YWD (or corporation? ; Newcastle Worswick Street, Northern; Scarborough Westwood, and Bridlington, EYMS; Skelhorne Street (Liverpool) and Carlisle, Ribble; Ammanford, James; Haverfordwest, Western Welsh; and this is now getting too far south for clear recollection – didn’t Southdown own a bus station at either Lewes or Uckfield? (one of the few instances of Southdown using their own premises – on the grounds that they’d already paid road tax to use the public roads, so why pay again to provide their own terminal facilities off-road). And then again what is a bus station – didn’t BMMO use its Stourbridge garage as a "bus station" of sorts? Oops, I forgot! Didn’t M&D own two bus stations in Maidstone until the early ’70s? As has been mentioned, body builders weren’t quite sure what to do with the new-fangled underfloor-engined chassis. A few builders seem to have noticed that, unlike half cabs where the front and rear were very different, it was possible here to build in features which emphasised the symmetry of the new shape. A flat side view of this Dominant in its original form would show this symmetry in the ‘wings’, and perhaps something similar was attempted in the mouldings above, but they didn’t quite have the nerve to carry it through. The whole idea was, of course, a big mistake, because a bus/coach is not a static object but something that moves FORWARD! The BET Group North Western Road Car Co also owned many of its bus stations – Macclesfield, Oldham, Altrincham, and Northwich for sure. This was fairly common practice among area agreement companies of any size. More interesting perhaps (to me at least!) are the independent operators who had their own bus stations – Birch Brothers’ Rushden facility springs to mind along with Blair & Palmer’s East Tower Street premises in Carlisle. Yes it is a petrol mower. The engine was made by another great British engineering company now long gone, Villiers of Wolverhampton. I use a modern Dennis on our bowling green, superb quality but unfortunately powered by a trouble-free Japanese engine, just like my car. Where did we go wrong? No. Don’t lets get started on that. Villiers was a long established company in small engines for motor-cycles and lawnmowers. In the early 1980s, they produced a 2-stroke engine for lawnmowers with Mountfields. Unfortunately, this was a disaster and led to the demise of the company. Mention of Villiers reminds me of a Fanny Barnett motorbike I had, briefly, in the 1950’s. It was a distress purchase from a friend, when my trusty Ariel broke down, and was soon sold on. A similar distress purchase was a Wartburg, also briefly owned. I was not a lover of two-strokes, although, of course, I exclude the Commer TS3 engine! Chris, my dad and I drove a 1967 Wartburg Knight from Stockport to Rome and back in the summer of 1967 with my mum and two sisters. Fuelling was a two stage process which we thought might cause problems once we left French and German speaking countries. The first fuel stop in Italy at Aosta we were approached by a typically dressed Italian widow, all in black. I handed her a note in Italian stating what we needed. Her reply was "Awight Duck, nah problem I’ll get ma son ta fill y’ap all cushty". Turns out that, though she was Italian, she’d lived in London from 1920 to 1965. The Wartburg was faultless, its 998cc engine tackling Alpine passes with 5 adults on board as brilliantly as it managed the autobahns and the Autostrada del Sole. I know others who share the positive view of the old Wartburg. I also know people who swore by – not at – their Comecon Skodas. As a dyed in the wool VW person (from Beetle onward) I am a very happy modern Skoda (VW in sheeps clothing) owner – despite recent comments by Phil. Just bought a new one at the weekend – so haven’t worn it out yet! Wife had a fourth hand Comecon Skoda in the late 1970s. Rubbish body ended up 50 shades of mustard but the engine and transmission were fantastic as, I’m told, were their PSVs which I have ridden on from time to time over the last 40 odd years. BTW my latest Skoda troubles with the bonnet lock follow on from a leaking water pump and damaged timing belt at 38,000 miles. Have had partial compensation from Skoda but they are hardly my favourite people at present. There was a lot of snobbery about Comecon products fostered by the likes of Clarkson and Co. who rarely have to pay for their motoring. Saab won the Monte Carlo Rally using a 3 cylinder 2 stroke engine just like the Wartburg. My daughter had a Comecon Skoda for a couple of years. I had to replace the water pump but other than that it was totally reliable. She then wanted a more fashionable Seat-disaster. For nearly 40 years I have ridden East German MZ motorcycles, I’m on my second one now. Practical, easy to maintain – just like we used to make in this country. A slightly late comment on Roger’s excellent article and the mention of the "hump" in the chassis rails – which was actually on the nearside only, over the engine and certainly no higher than the raised sections over front and rear axle. The contemporary press were most unforgiving and scathing with their comments about the uneven surface. Strangely, other manufacturers with even worse "humps" escaped such criticism. I have always thought that quite possibly the press were encouraged by the likes of AEC and Leyland who were marketing their chassis (Regal IV, Royal Tiger) with the expectation that the provided outriggers would be used as pick up points for the vertical body frames and floor. The truth was of course that many body builders simply ignored the top level of the chassis and used substantial cross bearers as a foundation for floor and body where required. Certainly though, this issue pointed the way to the later dead flat chassis on Reliance, Tiger Cub and Lancet UF, to name but three. Thanks for your very informative comment, Nick. I am sure that you are right in your suspicions that the ‘big two’ massaged the publicity machine of the commercial press to wound the sales of the Dominant. During WW2, notwithstanding the supreme peril of the nation, Rolls Royce, with its eye on post war dominance, tried every trick to get the Napier Sabre aero engine cancelled, and much of the unbalanced criticism of that engine that still holds sway today derives from that campaign. Dennis engineering was of a high order, but the trouble with the Dominant (and the later Lancet UF) was the dependence upon the old ‘O’ type gearbox once the Hobbs transmission had proved to be unreliable. That gearbox, with its sliding mesh engagement for indirect gears, and the preselective overdrive that required familiarity for successful operation, together with the wrong way round ‘right to left’ gate, required some skill in use when located halfway along the length of an underfloor engined chassis. If Dennis had equipped the Lancet UF from the outset with a straightforward constant mesh five speed gearbox as it did with the Loline, then the sales might well have been more of a challenge to AEC and Leyland. Roger, without wanting to drift too far off topic, there may well be truth in what you say about Rolls Royce but there is no doubt that the 24 cylinder H block Sabre suffered from complexity and poor quality control from the start which, had it emerged through a time of peace would have been solved. In time of war where reliability was all,it was too unreliable compared to the less powerful Merlin and probably too complex for the Erks to deal with as the war moved swiftly forward through Europe with minimal facilities at the forward bases where the Typhoons and Tempests found themselves in the ground attack role, the Sabre, for all its power being uncompetitive in dog fights above 21,000 feet. Post war there was little for the Sabre to power as air forces turned to jet and turboprop power. Phil, the legend of the Sabre’s ‘unreliability’ dies hard. The most convincing and clearly documented assessment of this engine may be found in the book "The Power to Fly" by the extraordinary author LJK Setright. This site, as you rightly point out, is not the forum for aero engine debates, but the facts about this remarkable engine show the traditional, Derby briefed view to be highly jaundiced. To quote Setright: "..when properly maintained instead of being criminally bodged (a reference to the widespread practice of tampering with the automatic boost control by mechanics at several airfields to achieve even higher outputs and thus airspeeds) it was exemplary in its reliability". Production of Typhoons totalled 3300, and that of Tempest V/VIs reached 942. Engine production would have well exceeded the 4242 airframe total. Those figures could not have been achieved by an untrustworthy piece of engineering. It’s high time that the Derby manipulated Sabre legend was despatched once and for all. Meanwhile, back at OBP…..